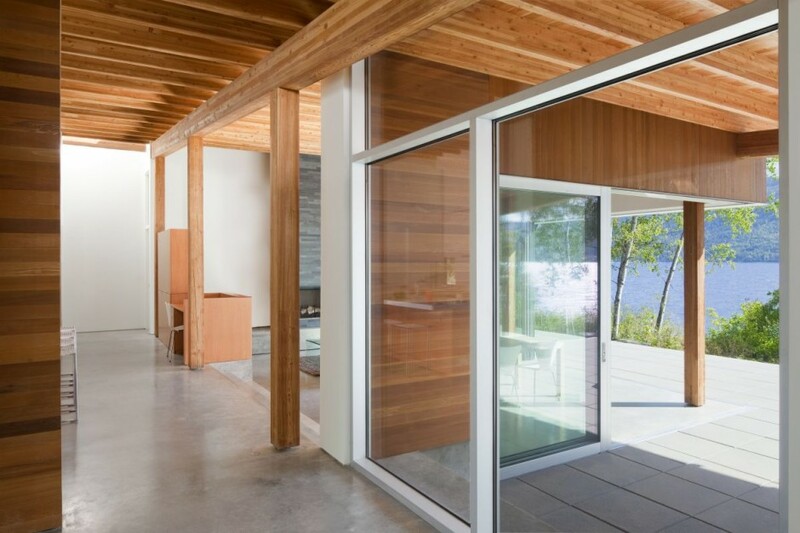 Mature Cedar, Poplar and Fir trees litter the site on the west, north and east sides. 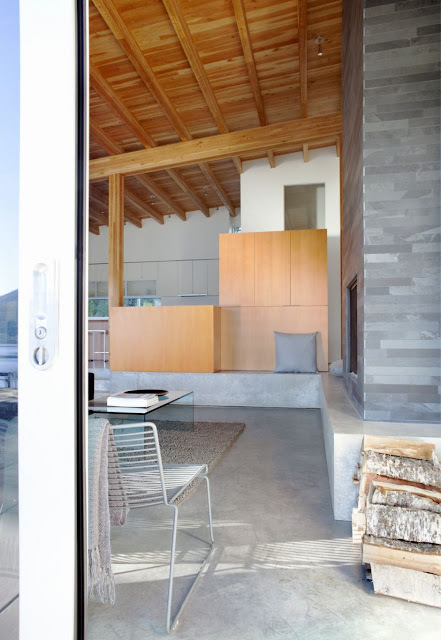 The southern portion of the site rolls towards the beach, dominated by 180-degree views of Shuswap lake and the low-lying hills that bound the lake’s opposite shoreline. 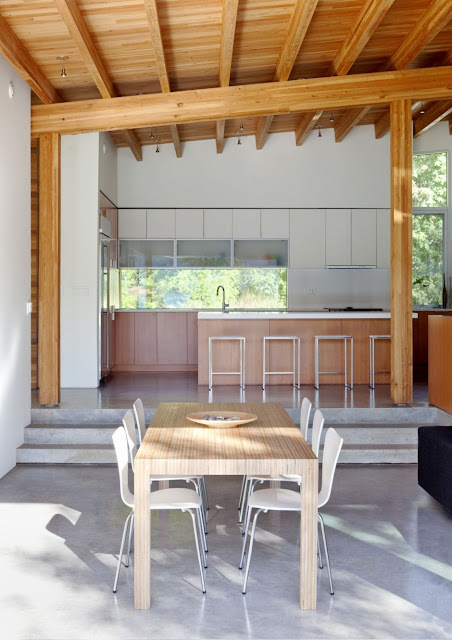 Designed as a seasonal retreat for a couple, this 2300 square foot single-level house was conceived to support weekends of casual outdoor/indoor living for the owners and their guests. 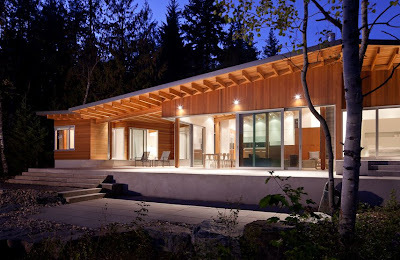 One of the main design objectives was to seek ways of marrying a traditional cabin vernacular with a open-concept space, modern, contemporary, tailored to its site and facilitating an ease of movement between exterior and interior spaces. This was achieved with the support of an extensive use of wood. 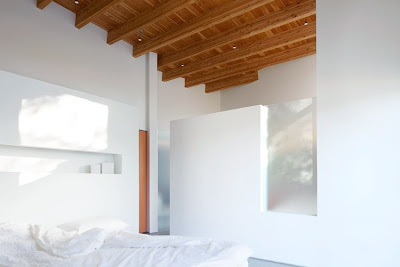 Upon entry into the space a clear structural order in wood becomes apparent. The interior spaces of the cabin are organized around a central circulation hall lined by a row of exposed 7”x 7-1/2” Douglas Fir glulam posts, and punctuated with light cast from skylights at either end. 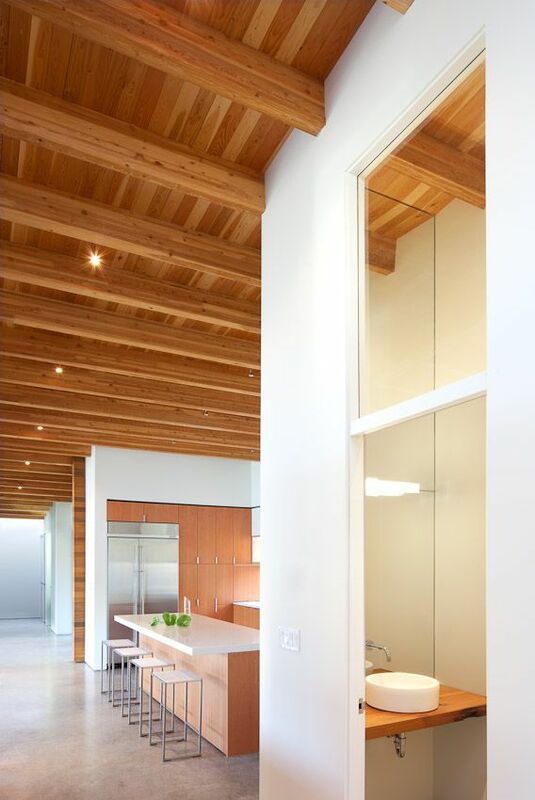 A 7”x12” glulam beam supporting 3”x9” exposed glulam joists, leads one from the main entry to the living area of the home as it gently rises to create a tall, light filled volume. In the opposite direction, the wood ceiling slopes down creating the compressed, intimate spaces of the guest bedrooms and library. A large outdoor room carved out of the plan separates the ‘guest wing’ from the rest of the cabin and serves as a shaded refuge from the intense summer sun. 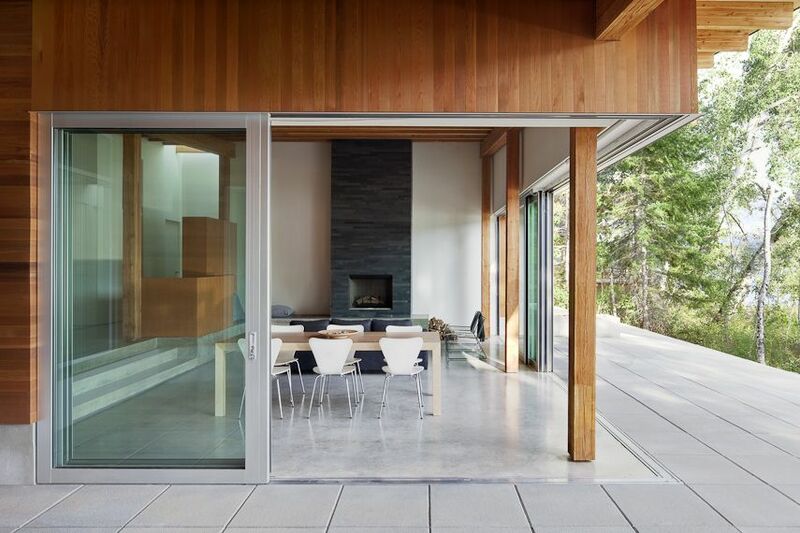 Glazed on its north, west and east sides and open on the south, the outdoor room allows for lake views from deep within the interior and blurs the boundary between outside and inside. Detailed to allow their bottom track to be flush with both exterior and interior floors when open, large sliding doors on the eastern side of the outdoor room expand the interior space outwards further eroding any clear demarcation of interior versus exterior spaces. 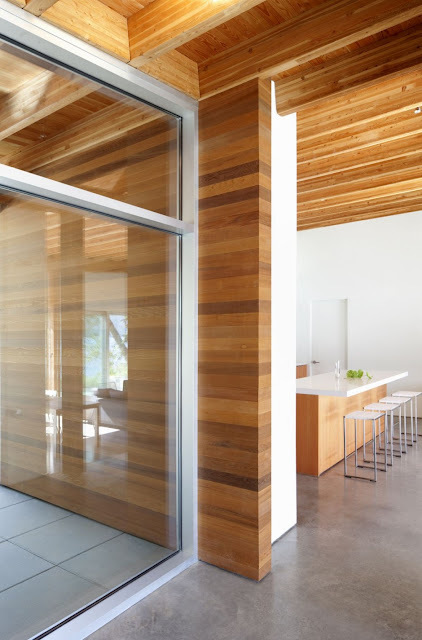 Together with a supporting cast of natural materials, wood ultimately works to shape, define and unite the spaces of the home seamlessly from inside to out. 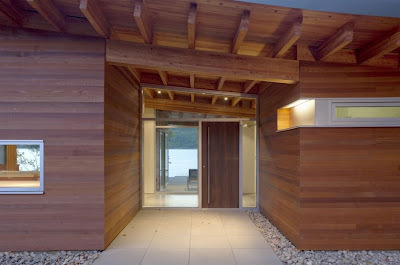 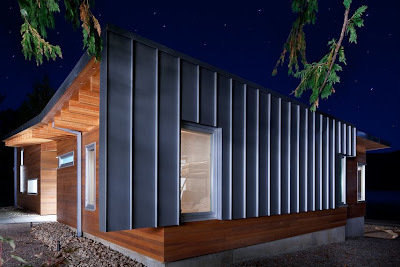 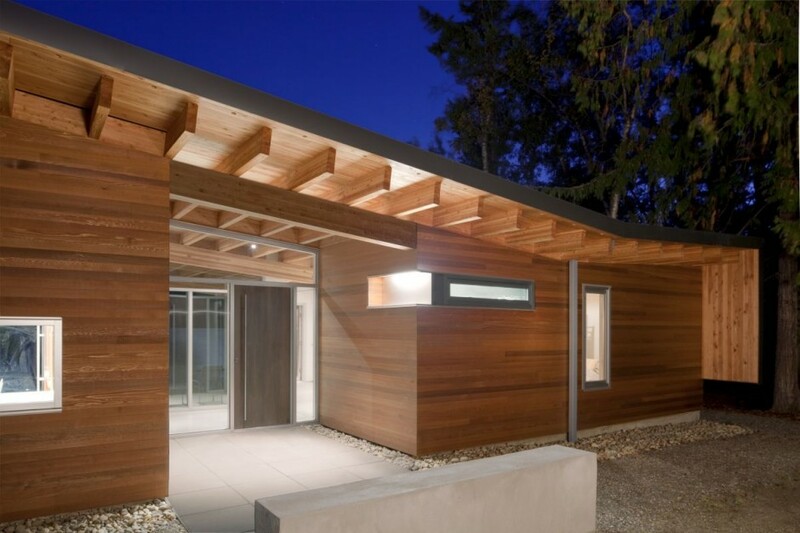 Western Red Cedar clad exterior walls continue through to the interior, becoming tactile elements in the enclosed space and important details in consideration of the overall interior palette. 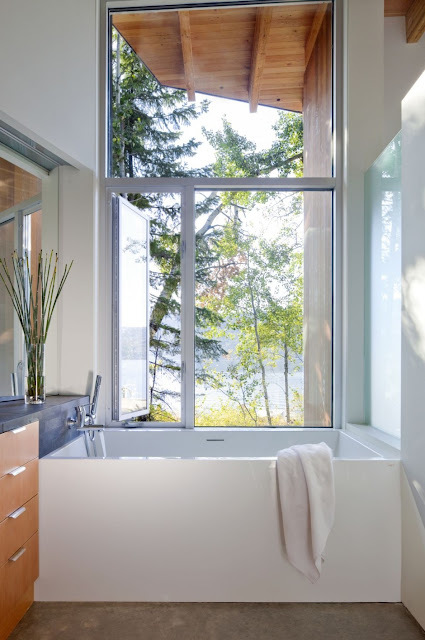 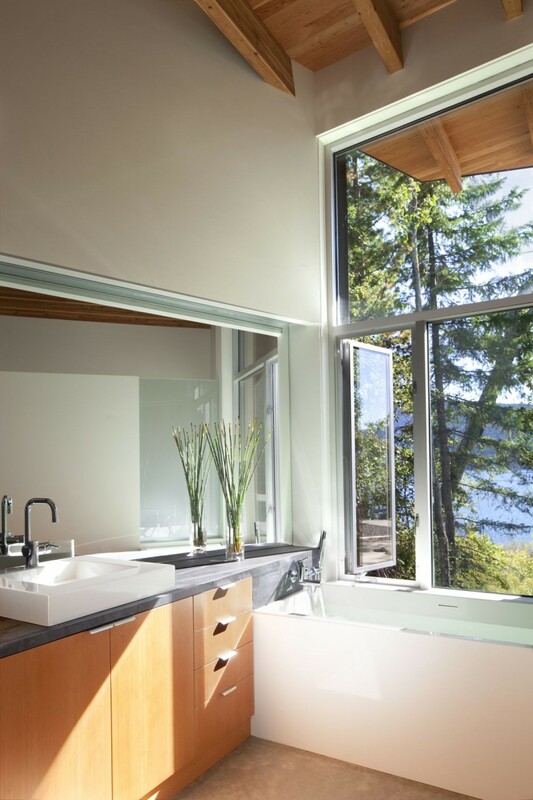 Vertical grain Douglas fir built-in millwork throughout the home references the living firs on the native lakeside site and imbues the clean, simple spaces with warmth and texture. Juxtaposed to these varying soft wood tones is a monolithic polished concrete floor and robust slate fireplace that anchors the home and draws one’s gaze upwards to the exposed Douglas Fir glulam roof structure and ceiling decking. These structural elements extend out to the exterior and define the continuous roof line that quietly commands the north and south elevations. 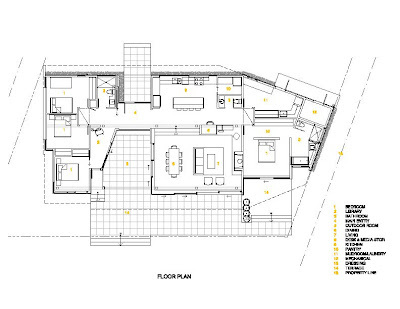 Subtle sloping undulations in the roof structure delineate the three main segments of the house: the living area, the guest-wing and the owners’ bedroom with en suite bathroom.